We have been in Tucson for four days now, and it’s been great. We’ve already seen a lot of family and friends, and have many more get togethers on the schedule (said the British way). And I’ve already had carne asada, Joel’s Jolt from Beyond Bread, Zinburger and am now sitting at Shish Kebab writing this as I wait for some friends. I am kind of hoping they are late, though, as I am still disgustingly full from breakfast. It was the best breakfast. My favorite type of breakfast, which I have greatly missed since moving to Miami. It was a Pinterest Birthday Breakfast. 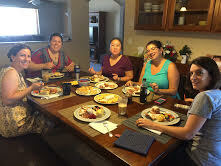 Pinterest Birthday Breakfasts are something some friends and I started doing a few years ago to celebrate birthdays. 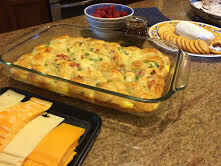 With 4-6 young kids present, leisurely mornings at restaurants weren’t happening, but we wanted to do something more special then a quiche/coffee cake gathering. And we all have Pinterest food boards, where we have pinned gorgeous looking dishes. Which we never make. But we really want to eat. The birthday girl actually had a board dedicated completely to breakfast foods, so we had plenty of recipes to choose from. The other girls made: Comfort Bake-Mmmmm; Baked Whole Wheat Peach Pancake; fresh fruit with a honey lime dressing; baguette with goat cheese and fig jam. It was all incredible. The peaches brought a really light flavor to the pancake and goat cheese is my crack. I decided to make Bacon Cinnamon Rolls, because 1) bacon cinnamon rolls and 2) they only have two ingredients so I figured that would be easiest since I’m not in my own home. Somehow though, I still managed to mess up the ingredients. The grocery store had four types of cinnamon rolls that I saw: orange flavored (not with bacon), reduced fat (please, why bother? ), store brand and a Pillsbury brand. I didn’t want to seem cheap and buy the store brand, so process of elimination left me with Pillsbury. So I grabbed it and went on my merry way. I pan fried the bacon for a couple minutes to get soft, then I opened the tube of cinnamon rolls. I took out the first one and went to unroll it, so I could roll the bacon into it. It didn’t unroll! I didn’t even know not unrolling was an option! So I ended up wrapping the bacon around the outside of the roll. Baked the rolls according to directions, iced them, and ate them. They were still good, but not as pretty as they would have been, and I think my bacon to cinnamon roll ratio was off as well. But at end of day I had bacon, cinnamon rolls, other delicious food, and my girls, so all is wonderful. Pan fry bacon for a couple minutes, till cooked but not crispy. 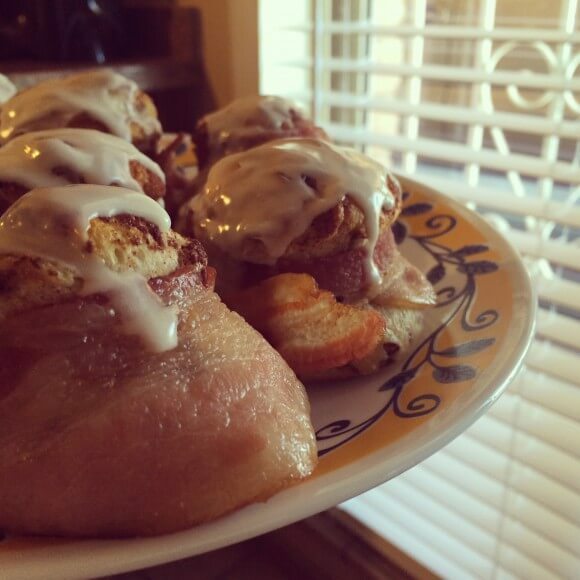 Unroll cinnamon rolls, and place a strip of bacon against dough. Reroll to form bun, with bacon on inside. Cook rolls according to directions.